This is the lovely Short & Sassy from China Glaze. It's a very pretty, regal, shimmery, burgundy red. This formula applies easily and is opaque in two coats. Unfortunately I was a bit heavy handed and applied some of it too thickly and generated some tiny bubbles, but a generous coat of Essie Good to Go took care of this problem. 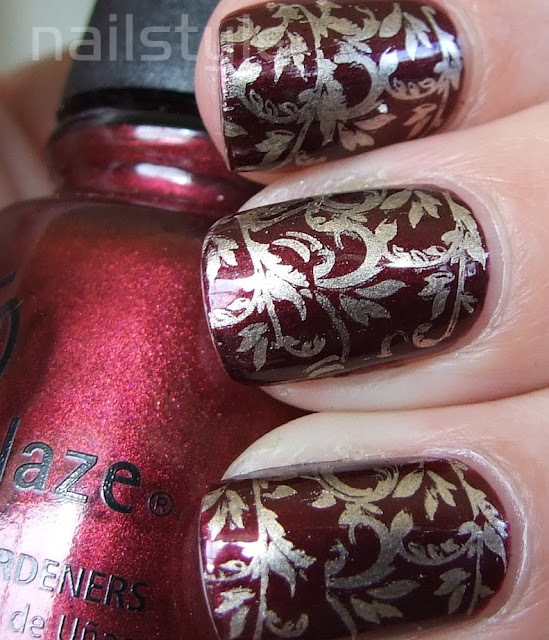 I did double stamp all of my nails with this image (except my pinkie finger) as the image is very small. Wouldn't it be great if BM were to duplicate these plates but in the same size as Konad plates? Oh, I love this! So elegant! I really love this color combo! So awesome! Thanks for your comments - this is one of my favourites!